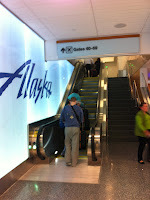 On March 20, 2012 Alaska Airlines relocated from Terminal 3 to Terminal 6. However a week after the grand move Alaska Airline unveiled their “airport of the future” design to the media and bloggers like myself! This design is already used at Anchorage and Seattle international airports and Alaska hope that this same design will cut wait times by 80% and allow travelers checking baggage to get from the Terminal door to the security line in a short 4 minutes! When I first walked into Terminal 6 I first noticed how clean and fresh the area looked. Being from Seattle I instantly recognized the airport of the future design, however this design is much smaller and refreshed than Seattle. Also unlike Seattle, I didn’t see a number of the ugly bulky free standing kiosks. Instead the check-in kiosks were stationed only at the end circular bag drop stations, in addition, I saw monitors above each bag drop location and a number of overhead screens directing me where to go. Unlike Seattle (or at least something I had never noticed before, however I rarely stop to check-in/drop a bag) bag drop stations were divided based on what they were used for. Large flat-screen TVs above each bag drop station informed you who and what it was serving. There was one for MVP, a larger quantity for pre-paid bags (those pesky bag fees can be paid for online or at the individual check-in kiosks), and one for all services. Per the station manager, the all service station would serve passengers who need to change their flights, missed flights, need their identification verified, etc. In addition to each station being individually marked, on the ceiling of the main corridor there were ore monitors that pointed you in the correct direction. Interestingly enough Alaska Airlines has recognized that certain flights (such as those to Mexico City and Guadalajara) tend to have more passengers that need additional help and often times passports that the kiosks cannot scan. Therefore for these flights they open up addition full service bag drops that are specially marked with select flights. Those who do not need additional assistant (have passports that scan) can bypass these longer lines and use any other bag drop location. Each bag drop location can have up to two check-in attendants; however each station only has 1 computer. The idea is to allow each attendant to go back and forth and serve customers in unison. As 1 employee is tagging a customer’s bag, the other employee is pulling up the next person’s itinerary and bag tags. The design also allows passengers to walk up and basically kick their bag over and have it land directly on the scale. No need to lift! The scale is also built directly into the conveyor belt, saving Alaska’s employees back. Once one is done checking in they can continue to the new escalator that leads up to security. The design is unique and patented by Alaska Airline; however I do see a lot of places that could possibly lead to bottle-necking. First off, each kiosks only has 1 computer, if something goes wrong both lines are now delayed. Furthermore, the design at Lax is two oval areas with a walk through design that leads to an escalator and stairs that continue up to security. The idea here is a “walk through” design. Start at the end, grab your ticket, next drop your bag, and continue in the same direction to the escalator to go up to security. No back tracking, however, if a line gets long, or if people meander confused by this revolutionary design, the walk through setup now becomes a mine field of bags and people. I imagine a baseball stadium after the 3rd out in the bottom of the 9th scenario during peak hours were travelers zig-zagging around each other trying to make their way towards security. This could become an issue as LAX continues to grow and larger planes (like the 737-900ER) start ascending and descending. Overall the check-in area is a HUGE improvement and deserves 10/10! The check-in counters are wood and granite and are very clean and crisp. Everything is easy on the eye and the illuminating blue Alaska Airline Eskimo is very welcoming and he smiles at you while you head towards security! This check-in area is Leaps and bounds ahead of any other at LAX! Upon entering the secured area of T6 you’re dumped out into the old continental terminals. Not updated in a number of years, the area screams old Continental. Not the best of airport terminals, but still an improvement with more windows and light than old T3. As one walks pass the United gate and the rebranded United club, one quickly enters a 1/2 oval room. The room has ground the ceiling windows, lots of blue leather seats, and power outlet galore! Alaska is proud to claim that 50% of all seats in the boarding area have power access! No more need to arm-wrestle your fellow travelers over the single charge point, instead recharge your iPad, smart phones, or computers while relaxing in your chair. The terminal also has large amounts of natural light that floods the room from all direction. The area reminds me of the old T3 after visiting a plastic surgeon in Beverly Hills! In all honestly the only reason it even resembles T3 is due to the shape of the room this section of T6 is used Domestic flights (and Horizon flights), for there is no direct connection to customs from these gates. As one continues further back into the terminal there’s another small escalator that takes one into another section of that terminal that include gates shared by Delta and Copa. However this area was completely remodeled and screams Alaska Airline. The Eskimo and blue is everywhere and finding any Delta or Copa Livery is nearly impossible. I did find 2 “sky priority” carpets at two separate gates and one small sign. However the kiosks at the gates were redesigned as the rest of the terminal and the entire terminal appear to be Alaska. Gone are the bulky grotesque desks and large half walls and instead the terminal is spotted with slender desks and floating flat screen TVs that display flight and gate information. Everything is modern and simple. The gates furthest from security are used for incoming international flights. Between the gates and boarding area is a secured area that loops completely around the terminal and then down to customs. I was not able to check this area out, but I did witness a Delta B747 deplaning and using this secured area. From what I was told this area does feature Global Entry Kiosks, my absolute favorite! This is also another huge improvement, for T3 did not have customs and passengers had to be bused to TBIT and then walk back landside to T3 to re-clear security! The new Terminal 6 at LAX is a travelers dream. It’s no HKG, ICN, or SIN airports but for LAX this face-lift is one that couldn’t have been done better! I think anyone who travels on Alaska through LAX is going to fall in love all over again with my hometown airline! As a traveler who hates LAX with a passion, T6 was inviting and easy to navigate. Security was a breeze and with connections (security side) to T5, T7, and T8 I was more than satisfied! Furthermore, with the move to T6 Alaska will now have preferential gate rights at 6 of the 10 gates 6 of the 10 gates they use. This means Alaska will always have access to 6 gates no matter what, at T3 Alaska has zero preferential gate rights! outlets, better food options, light, modern, clean and crisp!